It was 200 years ago to the day that the famous explorer Dr. David Livingstone, had taken his first breath of air. To mark the occasion, I was huddled around a bar room table in Victoria Falls, listening to historian Russel Gammon reflect on the Scottish explorer’s enigmatic life. Gammon’s warm voice filled the silence of the room as I listened carefully to the amazing stories that made up Livingstone’s years in Africa. It may have been the atmosphere around his bicentenary birthday that made the stories seem all the more relevant to me. Or maybe it was the Whiskey I was sipping. Or possibly it was the fact that I had already spent the better part of a week doing some exploring of my own. Whichever way, each time Gammon mentioned the Zambezi, I was instantly able to place myself in Livingstone’s shoes, battling my way up and down unknown rivers in search of the African dream. Reflecting on the days before, I couldn’t help but think that if David Livingstone were still alive, he would really love Victoria Falls as it is now. There’s so much to do and being the adventurous type himself, he would really enjoy some of the activities on offer. Livingstone spent much of his time in Africa battling up the Zambezi, in search of a steamboat route that would deliver what he called the three C’s – Christianity, commerce and civilisation – into the African interior. He did not know it at the time, but he was up against terrible odds, particularly when attempting to get past the Kabora Basa section of river in Mozambique. This massive gorge was completely impassable with the technology of the time and his funding from the British government soon dried up. I think given the pain and suffering he incurred trying to make it upstream, he would really appreciate the relaxed paddle through the Kazuma National Park. 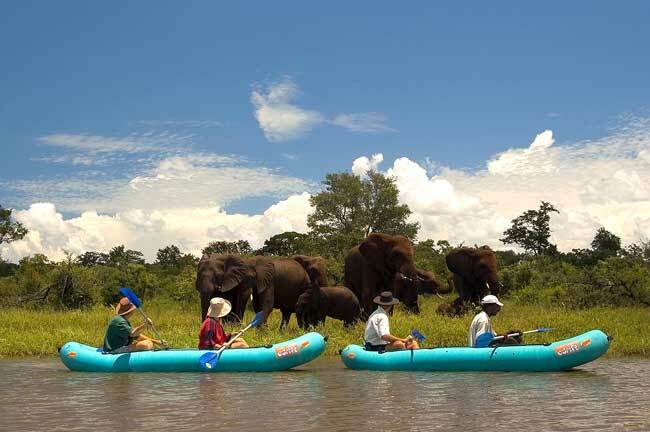 The Park is 30 000 hectares in size, and I paddled 15 kilometres down its course to just above the Victoria Falls. At one point I was quietly drifting along the bank watching a troop of baboons play in the tree above me, when down strolled a big bull elephant for an afternoon drink. In the distance I could see spray from Victoria Falls drift nearly a kilometre up into the air. This is why Livingstone loved Africa. 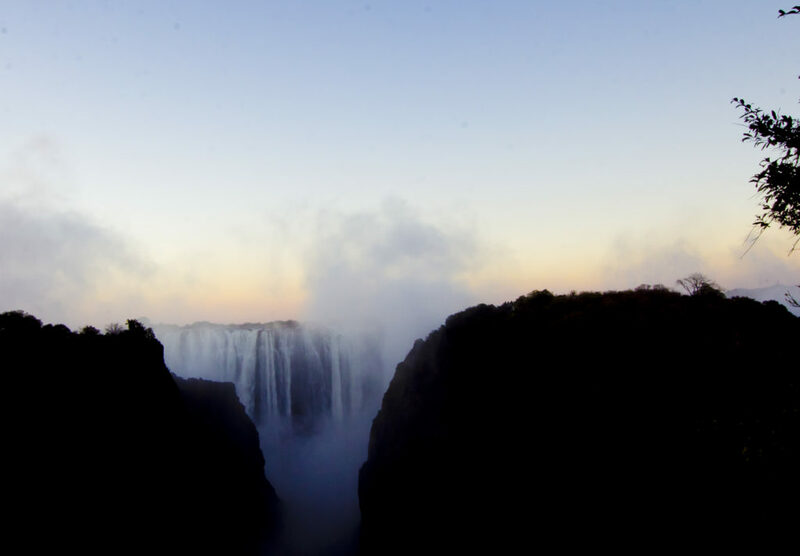 To see the Victoria Falls for myself was a reminder of why this discovery became such a big notch on Livingstone’s belt. It’s nothing short of remarkable. The river was flooding at the time and the amount of water that was tumbling over those falls is impossible to describe in any way other than scientific terms – which would be about 500 000 cubic metres per minute! There’s a paved walkway, extending out to a number of viewpoints that puts you practically in the falls. If you remember the feeling as a child of playing outside during a sunny downpour, you’d have some idea of how it is to stroll along the forests adjacent to that torrent. The Tram leaves every morning and afternoon from the Victoria Falls Hotel. I caught the evening departure, taking in the colonial atmosphere of the train as it chugged through a nature reserve to the famous Vic Falls Bridge. I think this bridge would have blown Livingstone away. For someone who spent so much of his time fighting up rivers in search of a trade route to the sea, a simple bridge over the impassable Batoka Gorge would be quite miraculous. The history of the bridge, presented theatrically by a gentleman pretending to be the French architect George Imbo, reveals how incredibly complex this job was. I was left amazed by the progress and ingenuity of those colonial pioneers, on a mission to realise Cecil John Rhodes’ dream of creating a train route from Cape Town to Cairo. David Livingstone was a risk-taker. So I have little doubt he’d be one of the first people to raise his hand if asked to dive head first over the Victoria Falls Bridge, with only a rubber cable preventing him from plunging to certain death. 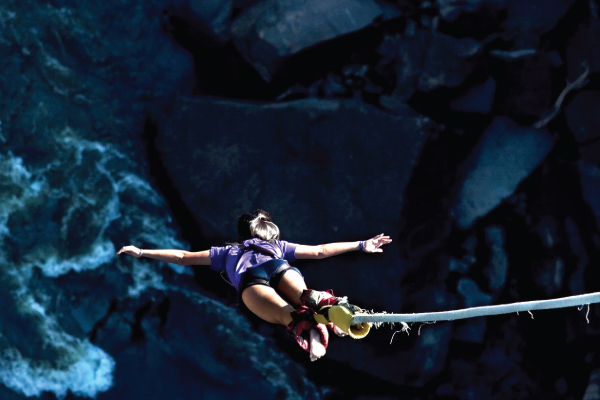 Bridge jumps, swings and zip lines from one side of the gorge to the other are also on offer, and although I did not have the time to do all the activities, I have no doubt that even Livingstone would get his full share of thrills out of a day spent there! Comfort may have been as issue 200 years ago, but it’s certainly not now. I have no doubt Livingstone would enjoy revelling in the comfort and luxury of the Victoria Falls Safari Lodge for a few days. With so much to do in the area, there’s no better base to relax than this warm location. Incredible views of the bush from the balconies, and the opportunity to go on guided game walks and drives – its here that he would feel most at home. I would recommend Russel Gammon’s history talk to anyone with an interest in history, and even to those who don’t. History puts travel into context and I really felt that the story made my experience of Victoria Falls far richer. If Livingstone was around to hear it, I hope he would be happy with Gammon’s interpretations of his life – because I was riveted by all of it. Livingstone’s body lies in England next to that of Charles Darwin, but his heart literally lies in Africa. It was buried under an Mvula tree – now the site of his memorial. His two most loyal African friends, Sussi and Chuma, carried his body a full 3000 kilometres to the coast so it could be shipped back home to England. There’s a profound respect for the man, not only by travellers but also by the local African people too. He was a towering figure in African history and a ferocious advocate of the end of the slave trade. He touched many of the people he encountered on his journeys and inspired people from all around the world. Dr. Livingstone uttered what I believe to be the best travel quote of all time: “I will go anywhere, provided it be forward”. This always inspires me on to new experiences. So of all the birthday presents I would give to Livingstone (that is if he were still alive today), the gift he would most appreciate, I believe, would be simply to explore more of Africa.